As we did last post, here's the graph without delay. Which Justices practiced judicial restraint? That is, judicial "modesty and humility"--as Chief Justice Roberts said he would at his confirmation hearings. You know, deference to the lawmakers. Respect for the choices of the Congress and the States. Reluctance to overrule their decisions. Affording considerable leeway to those more accountable, more democratic, more representative, closer-to-the-people arms of the government. In short, invalidating a law enacted by Congress or the States only when that law is clearly unconstitutional. When there's no doubt about it. The law violates an unmistakable command of the Constitution. So which Justices practiced the John Roberts "modesty and humility" of judicial restraint? More precisely, how frequently did each Justice exercise judicial restraint? And how frequently the opposite--i.e., the apparently dreaded judicial activism? How frequently voting to overrule the people's representatives? So, which Justices were truly dedicated to judicial restraint? Not in the easy cases--that's easy! But in the tough, close cases? 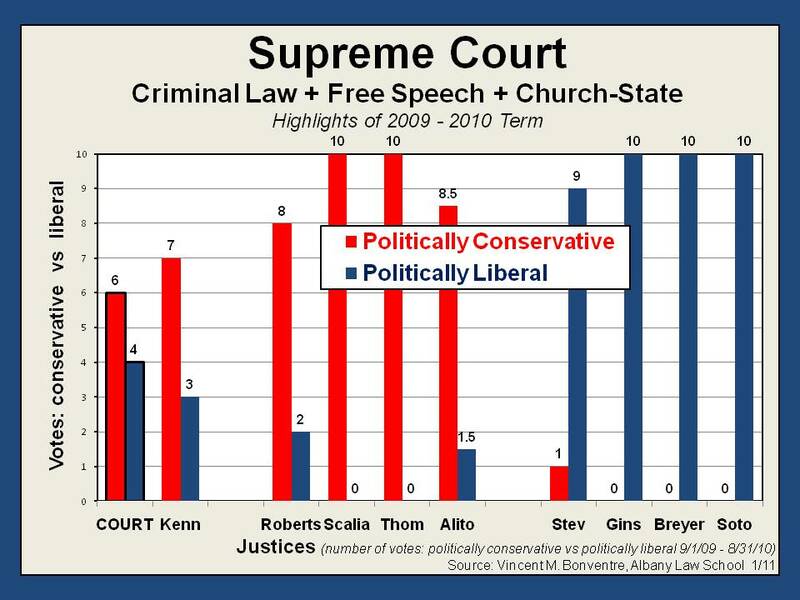 What is significant is that both the conservative and liberal Justices were sometimes restrained and sometimes active. And neither group of Justices was particularly more restrained or activist than the other. --anti-discrimination against gays and lesbians as applied to a student religious group. Without more, you can guess which laws were generally favored and which opposed by the conservative Justices. And which by the liberals. 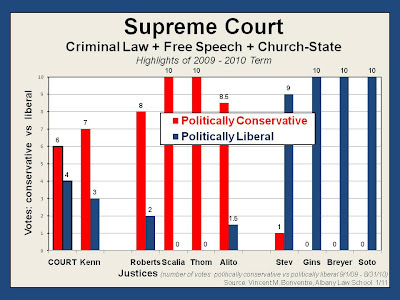 The conservative Justices generally supported laws for the display of the Christian cross, the life-sentence for juvenile crimes, and the war on terror. They generally opposed laws limiting campaign spending limits by corporations, controlling gun possession, and prohibiting discrimination against gays and lesbians. They were divided on the "honest services" fraud statute. The liberal Justices generally took exactly the opposite position, and they all supported saving the "honest services"law. Now none of that is surprising. And why? It has absolutely nothing to do with judicial restraint versus activism. Absolutely nothing to do with the conservative Justices practicing "modesty and humility" versus the liberals being activist. Or vice-versa. 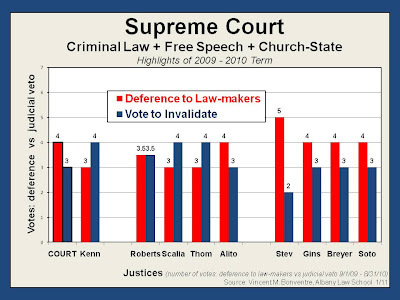 The conservative Justices--that's Chief Justice Roberts and Justices Scalia, Thomas, and Alito--voted like conservative Republican politicians. Not like judicial restraintists. Not with "modesty and humility." Seriously, just look at this graph. Look at the stark, unmistakable, glaring divide. That divide is politically conservative Republican versus politically liberal Democratic. Not judicially conservative (i.e., restrained) versus judicially liberal (i.e., activist). But politically conservative versus politically liberal--as in the polarized, partisan divide of Republican and Democratic politicians. Hmm. Not a very encouraging, inspiring, confidence-inducing portrait of the Court. Not if the purpose of the Court is something different than that of the political branches. Different than the political parties. Not if the role of the Justices is to be impartial, objective, non-partisan, neutral. At least to be that in a legal, judicial sense. No, we are not getting that with the current Court. Not with its current composition. Not with the conservative Justices on the Court. Nor with the liberals. In the next post, for the purposes of full disclosure, we'll (i.e., I'll) reveal how I would have voted in these cases. How my votes would line up with those of the Justices and with the Court itself. Not that I'm deluding myself that anyone especially cares how I would have voted. But just to put the disclosure on the record. And to be perfectly candid, because I have fun doing it!